Converters are explicitely set in the options method when manipulating Range objects or in the @xw.arg and @xw.ret decorators when using UDFs. If no converter is specified, the default converter is applied when reading. When writing, xlwings will automatically apply the correct converter (if available) according to the object’s type that is being written to Excel. If no converter is found for that type, it falls back to the default converter. 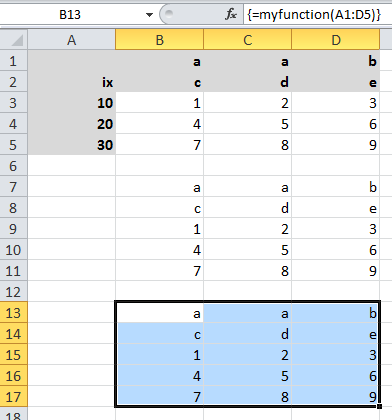 Note: Excel always stores numbers internally as floats, which is the reason why the int converter rounds numbers first before turning them into integers. Otherwise it could happen that e.g. 5 might be returned as 4 in case it is represented as a floating point number that is slightly smaller than 5. Should you require Python’s original int in your converter, use raw int instead. The expand method is only available on Range objects as UDFs only allow to manipulate the calling cells.